Weavings for home and comfort. 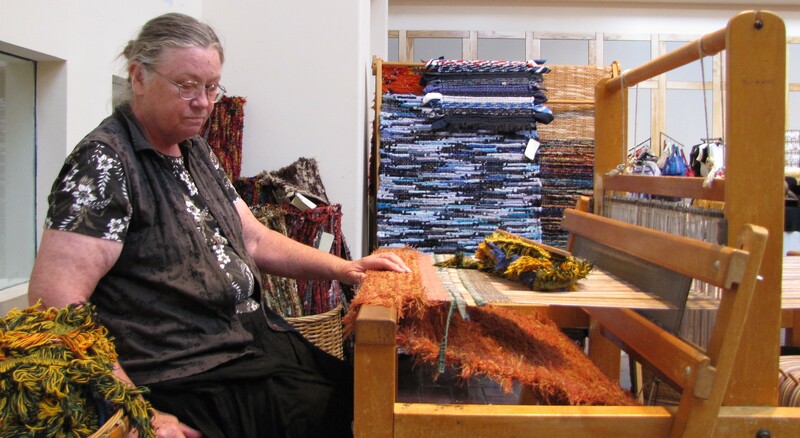 Here is Sandy Voss of Cabin Textiles at her loom at the Festival. 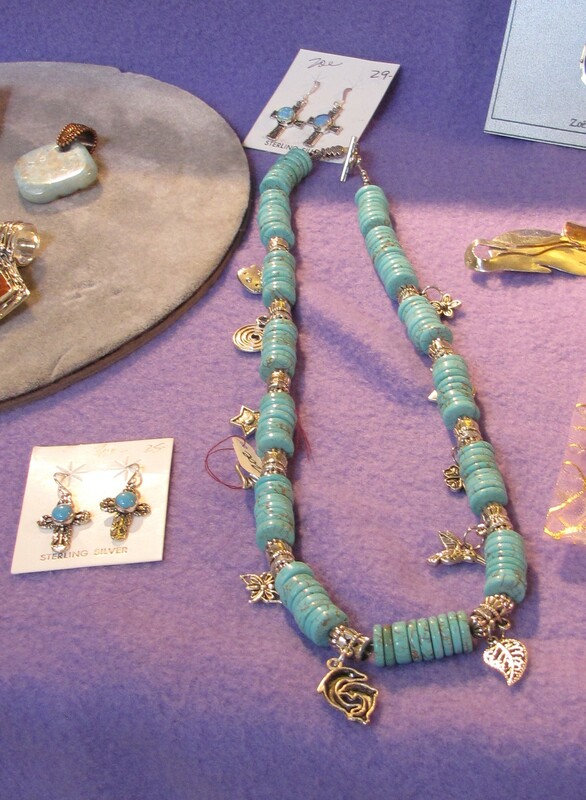 This was my first year assisting my mom, Sandy Voss of Cabin Textiles, with Rag Rug Festival held by the New Mexico Women’s Foundation in Santa Fe, NM August 9th, 10th, & 11th. This year the Rag Rug Festival was held at the International Folk Art Museum on Museum Hill, instead of the Udall Building as in years past. The artists, somewhere between 30-40 (my guess), had most of Friday to set up prior to a special ticket preview night that went to 8PM. There was light food and a small bar and a full array of fashions on display by artists and patrons alike. I live an hour and a half north of this shin dig and I was beat by the time I got home. I was quite surprised by the variety of arts on display as I had assumed the bulk of the wares would be some sort of woven art. While there were perhaps 6 rag rug weavers on display, there was also felting, gourd art, silk painted clothing, jewelry, hats, bags, scarves, quilting, and a number of other things. Some Enchanted Weavings brought her stripper and sewing machine to demo. 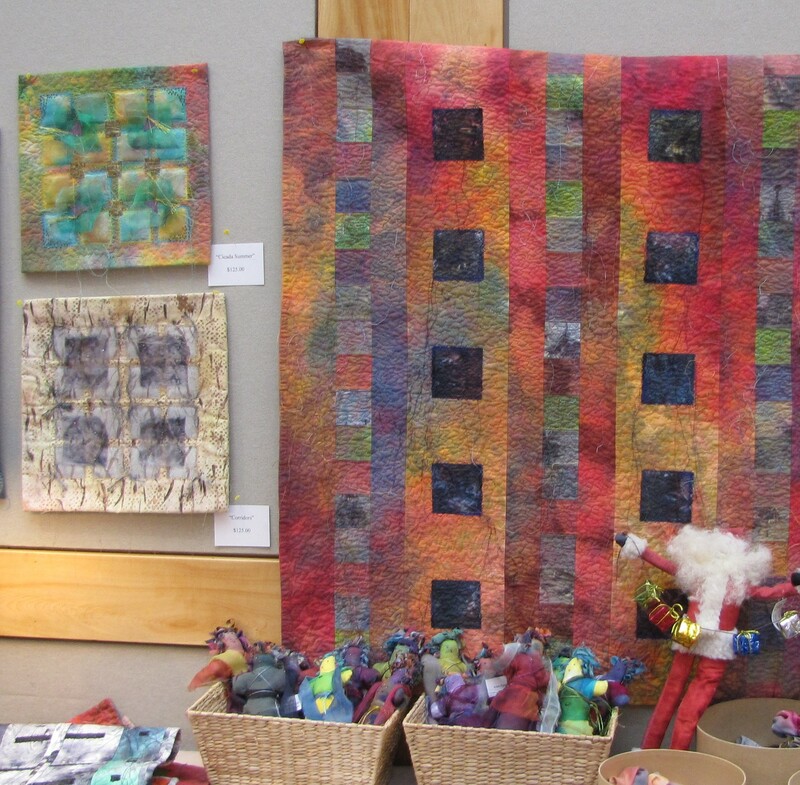 Both Saturday and Sunday the Rag Rug Festival, sprawled over three rooms, was open to the public 10-4 and the museum from 10-5 for free. My mom brought one of her looms to demonstrate making a rug. 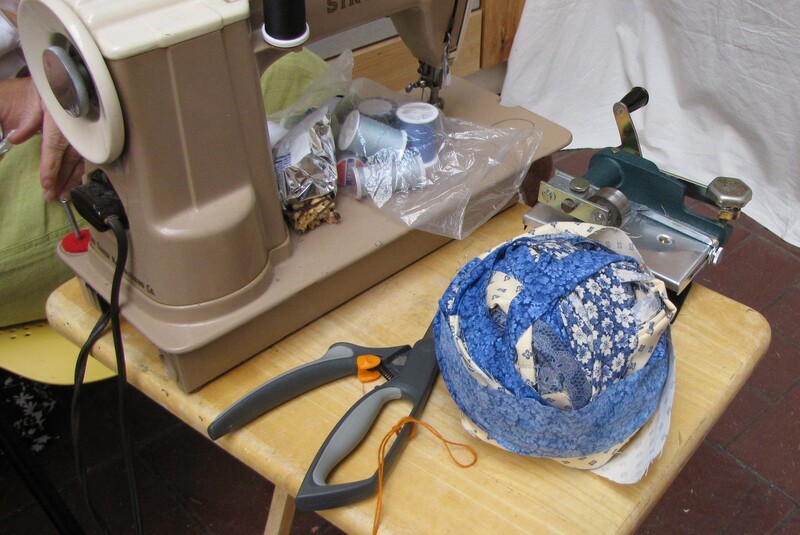 All artists were asked to bring something to demo, so I saw a spinning wheel, some henna art, sewing, and a stripper (not as exciting as some of you are thinking – it’s actually a wheeled blade for cutting fabric into strips). I brought some sock loops to show customers the basics of creating long strands of sock loops for weaving. I also had some left over warp that I made into braided plant hangers. But, really, folks were way more interested in watching me untangle Pendleton shag (the selvedge edge of the blanket that usually goes to the landfill if not put to use by artists) for my mom to weave. By far, the loom was a draw. I let little kids climb on it as I know how tough rag rug looms are. Several adults wanted to give weaving a try too. 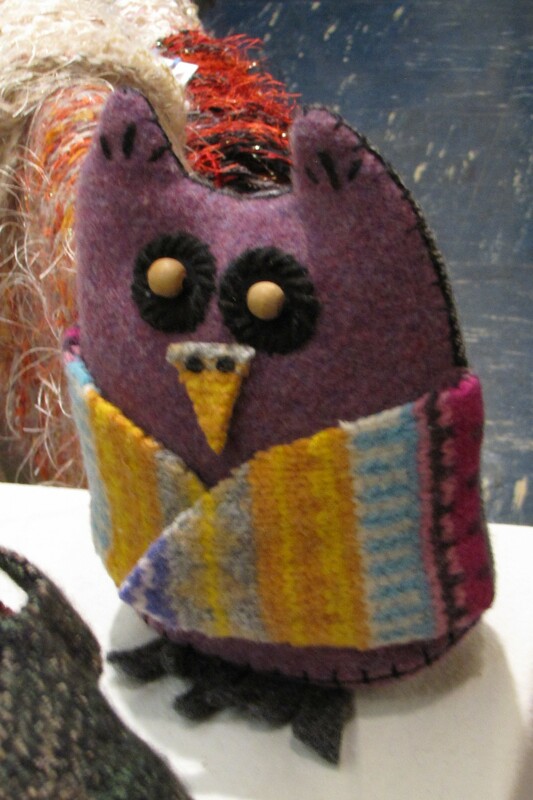 Here is an UpCycled Fashion felt owl. Saturday had more sales for Cabin Textiles, but less traffic. There were lulls where either one of us could go walking for an hour or so and see the other artists. This is where I walked around taking pictures for this blog. Most folks were quite happy to let me take pictures. Some wanted to know why and I told them because my grandma reads this blog and most found that quite amusing, even sweet. If anyone still had doubts as to my innocent silliness, I told them who I was and that I was helping my mom for the weekend and once folks heard my mom’s name, everyone was cool with me taking pictures. Someone was kind enough to explain to me afterwards that sometimes nefarious types take pictures of folk art with the intent of reproducing that type or style and selling their items as original ideas. If I find such nefarious folks, I will personally tweak their noses. Anyway, this points to just how much I have to learn about shows. 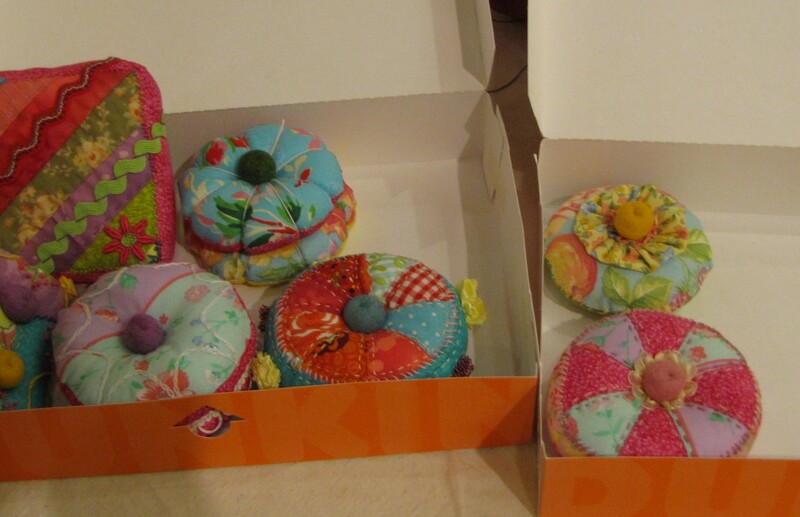 The ladies of the NaNeelzhiin Women’s’ Craft Circle put on a beautiful display. Sunday had more traffic, and plenty of it chatty, but less sales. We heard the same from more than one vendor. In some ways, we were busier because we had more folks wanting to try the loom or talk about local weaving classes (like at the Espanola Valley Fiber Arts Center). I had another bag of shag to untangle. I also brought some chocolate candies to share with artists and patrons alike, though I think we and our neighboring vendors ate more chocolate than the wandering customers. I got to do plenty of people watching over the weekend, a favorite past time. It was very interesting to see the huge variety of people who came through the doors. Some were just visiting the museum and happened upon the Rag Rug Festival, while others are repeat customers year after year. Some folks spend much of their year in other countries and make a point of visiting Rag Rug Festival when they are in NM. I did manage to break away for about an hour Sunday to see the rest of the museum. They have a very eclectic doll and figurine collection in a very, very large room. Also there was a Japanese kite show on display that was quite something. Quilt work by The Common Thread. The museum provided large dollys for bringing items in and hauling them out. However, the museum guys were not allowed to load, unload, or handle the items in anyway. They did make an exception for my mom’s loom. After all, it is unlikely the museum staff would be blamed if the loom went missing later, which I think was the concern for all of the smaller items. They did have a nice big freight elevator we got to ride in with our items. As you can imagine, the artists had to dress not only to impress but to also be able to haul their own wares about. 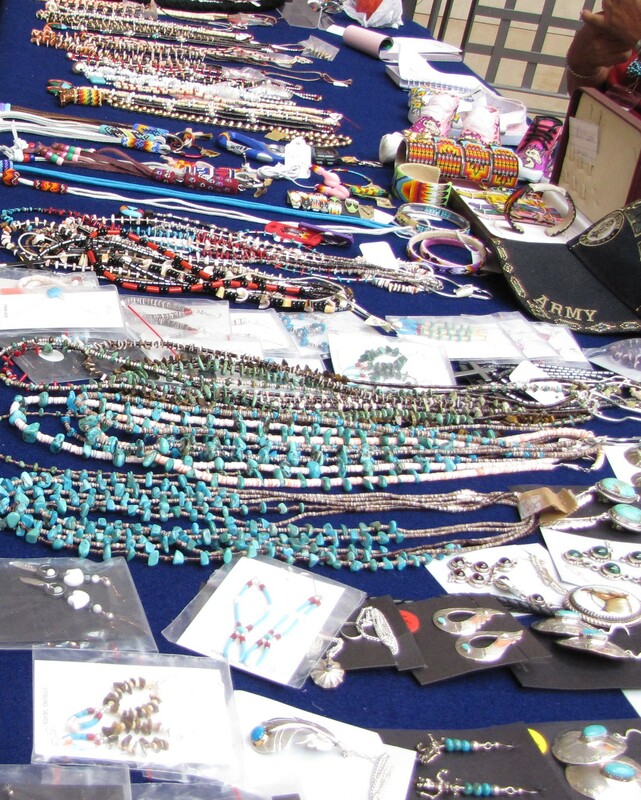 Many vendors said that attendance was way down from years past, though the museum said their average weekend attendance was up (remember, this is the first year having the Festival in the museum). Also, there was very little advertising. I don’t know the reason for this, but even an internet search turned up very little information. I also overheard a few patrons expressing their frustration at the limited number of rag rug vendors (6?) on display compared to the rather eclectic variety of arts on display. 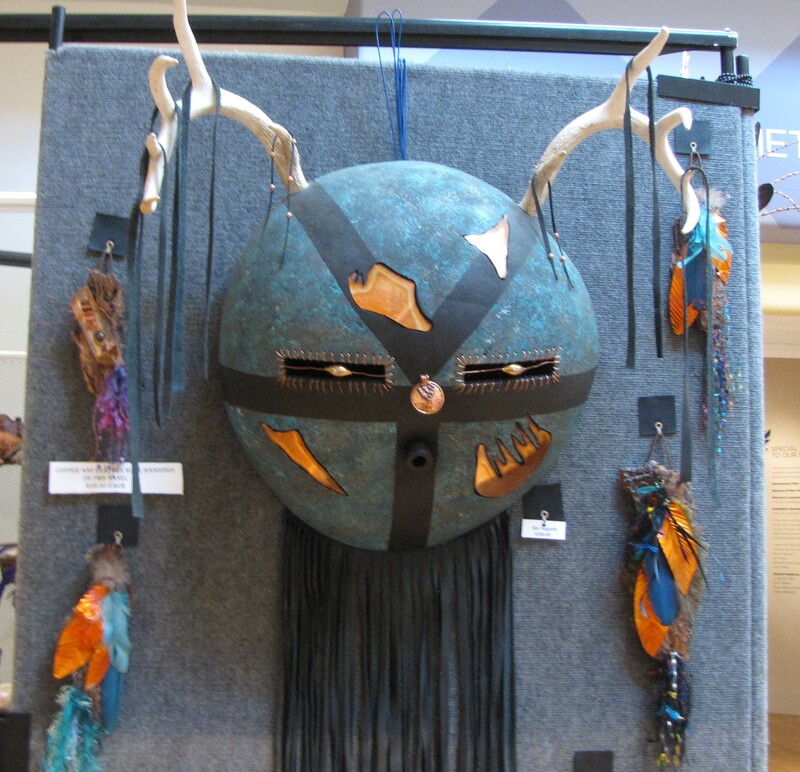 Gourd antler mask by Eye of the Beholder. Stunning! This being my first time helping out with this Festival, I had a great time. I had intended to simply give my mom support during the core hours of the day (like from 11 or 12 to 2) so that she could take a break if she wanted. But all 3 days I found myself staying until closing because I was enjoying the camaraderie of the show, chatting with the customers, letting kids use the loom as a jungle gym, and exploring the museum. One of my knitting friends was able to make it by and it was so great to catch up with her (thanks P.H.!). Taking pictures was also fun as it gave me a great excuse to talk with the other artists and ask them about their work. 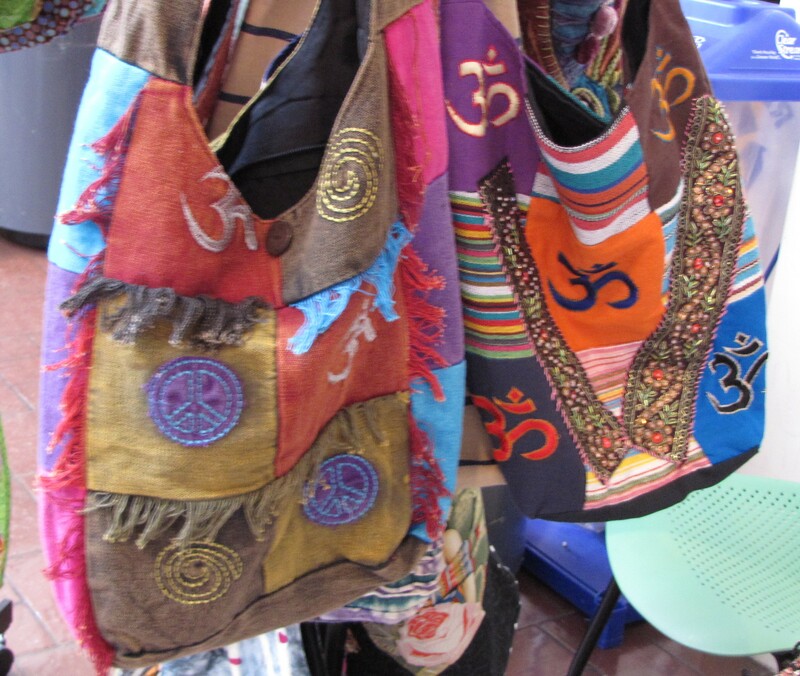 Colorful bags by Subedi Enterprises. So, who all did I harass for pictures? Let me say two things first: I am a bit shy in social situations, so if the artist was busy with customers, I didn’t approach to snap away pictures; second, I always made sure to ask if I could take pictures and a few folks were a little suspicious at first, which only increased my shyness. So, this is only a few of the many wonderful artists that were present at this show. I thank each of these artists for indulging my latent reporter skills and letting me take pictures. 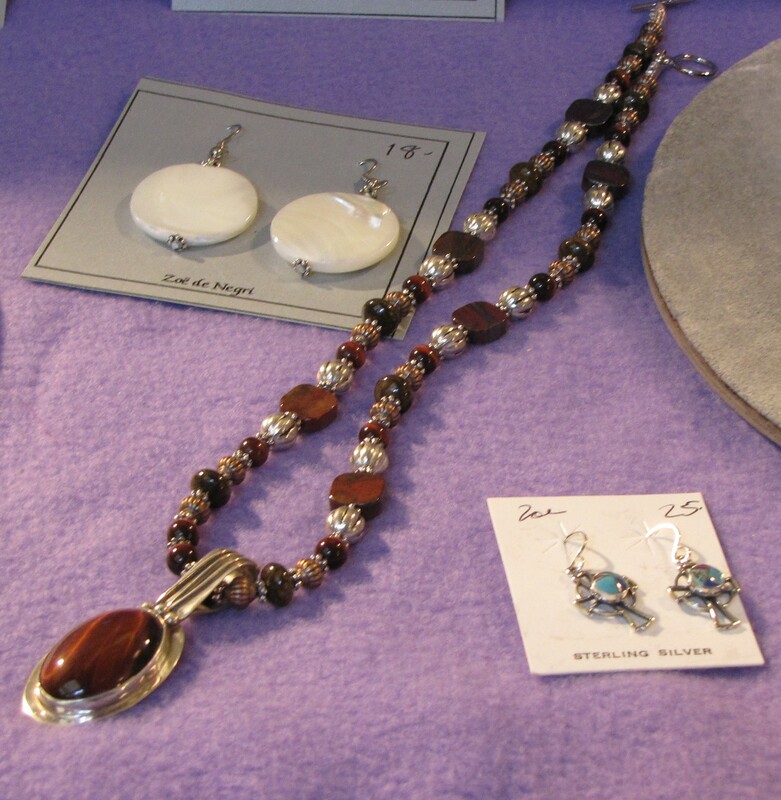 Necklace & earrings by Shamana Jewelry. These little Badgersong ‘donuts’ were quite the eyecatcher. NaNeelzhiin Women’s Craft Circle (these ladies were right across the aisle from us and were often entertained by the kids playing on the loom). Unfortunately, they were out of business cards and I could not find any contact info on the internet for them. 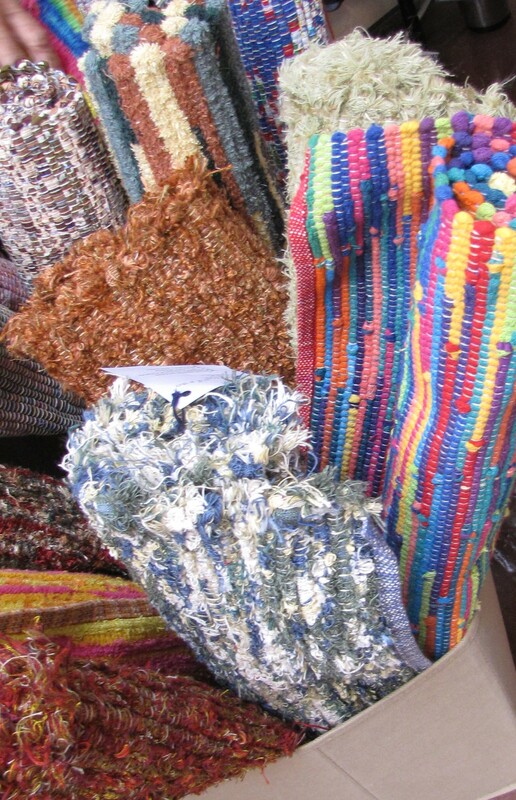 Rag rugs by Some Enchanted Weavings. 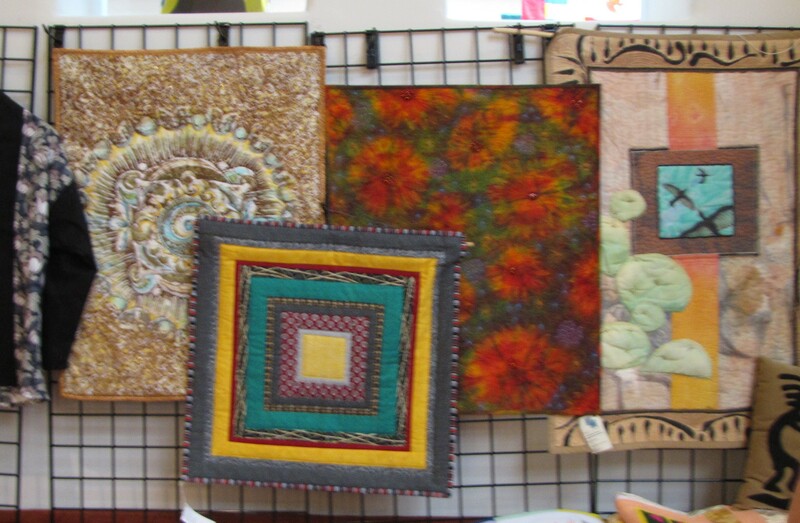 Artist Renee Brainard Gentz showed off some fabulous pieces made from silk. 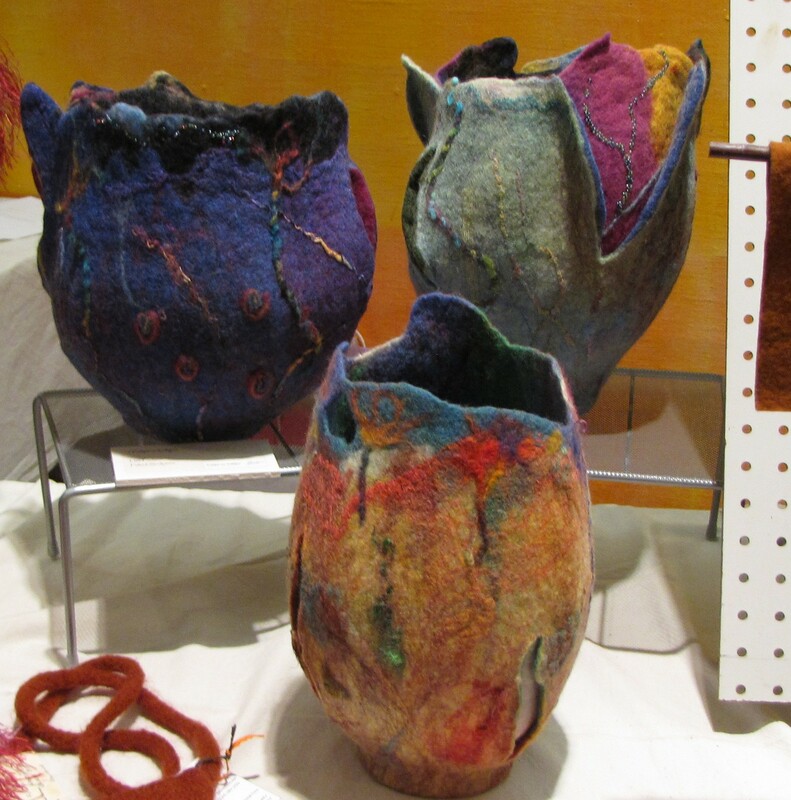 These felt ‘vases’ by TDLT Fiber Artisans are great. 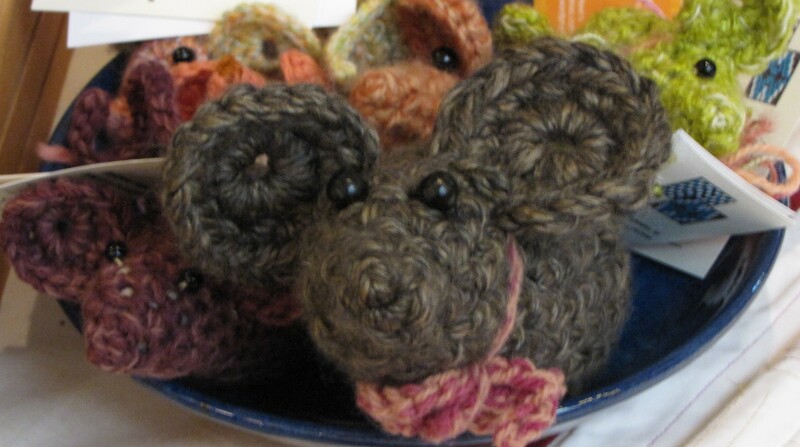 The Common Thread mice were well behaved and too cute. 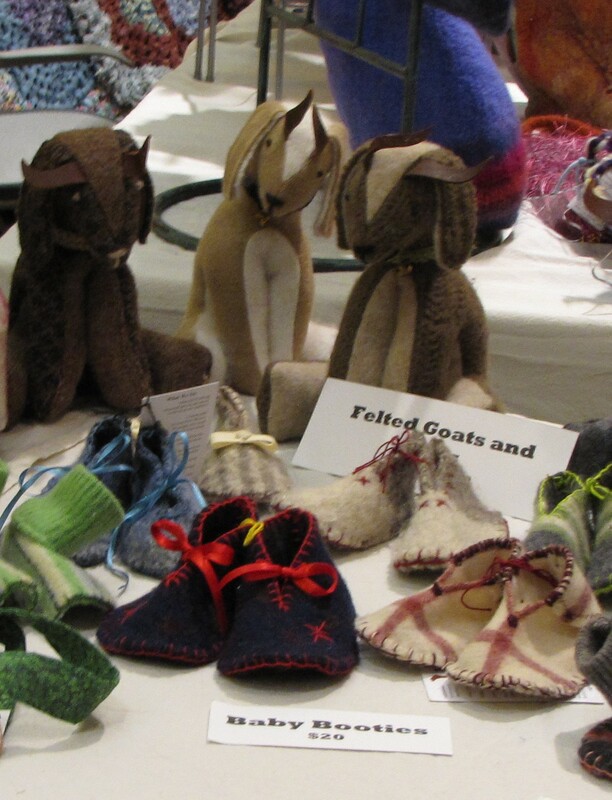 Felt goats (I do so love goats) and felt baby boots by UpCycled Fashion. 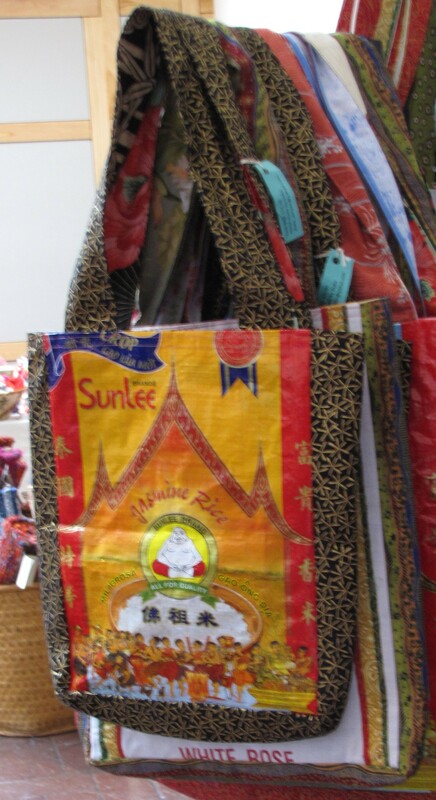 Another cool bag from Subedi Enterprises. 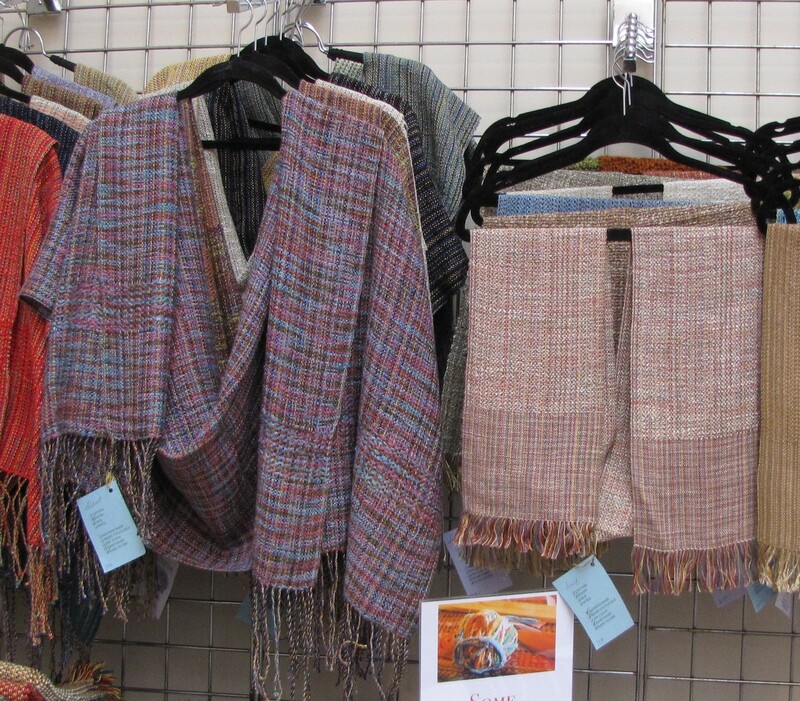 Shawls & scarves by Some Enchanted Weavings. Another beautiful piece from Shamana Jewelry. Potholders & scarves by Some Enchanted Weavings. 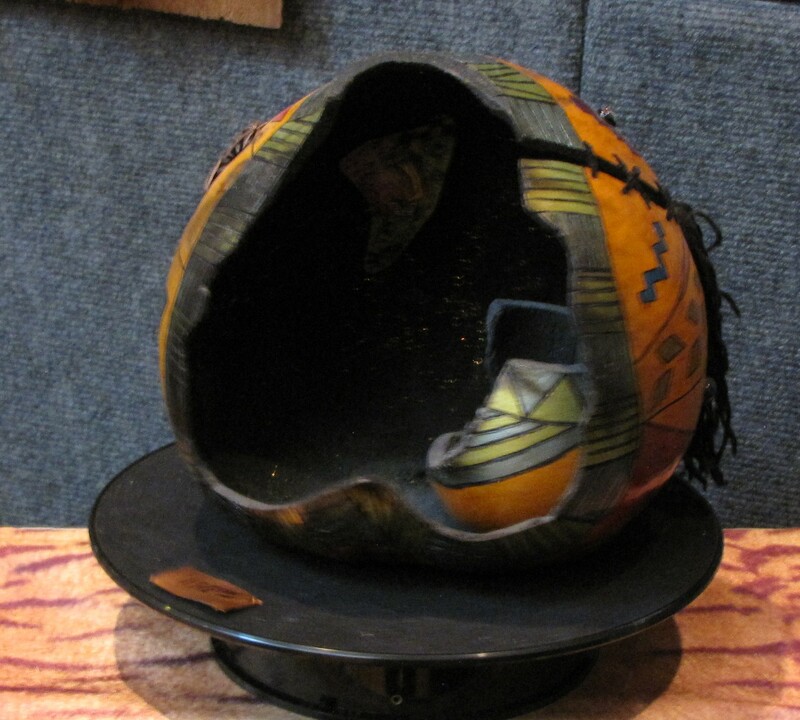 This gourd was cut open and decorated inside & outside by Eye of the Beholder. 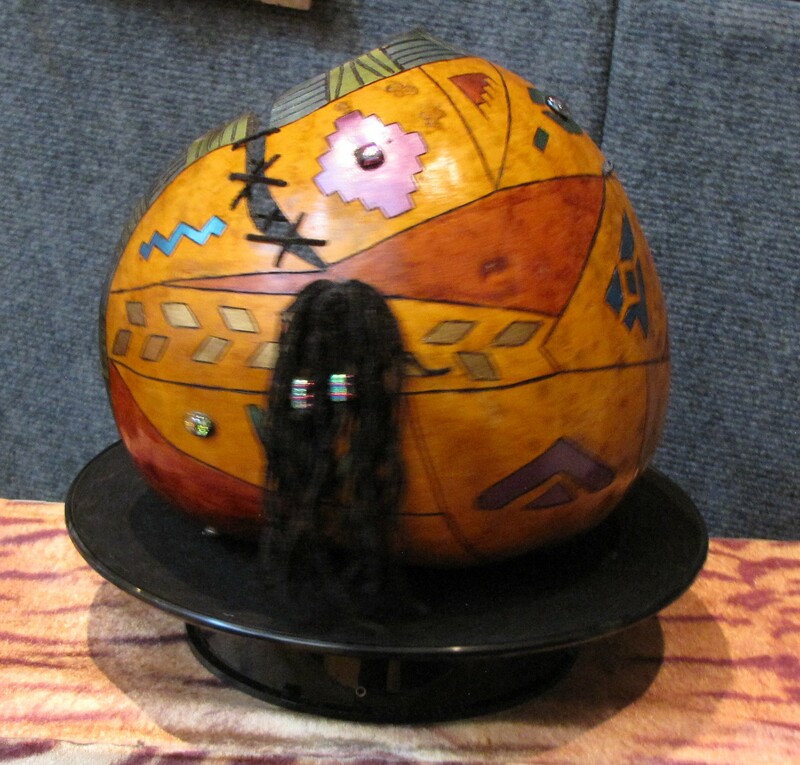 Here is the backside of that same hollowed out gourd, by Eye of the Beholder. So, What’s Up With That Face Leash? Miss Snarky Pants on To Sew The Ends Or Not?